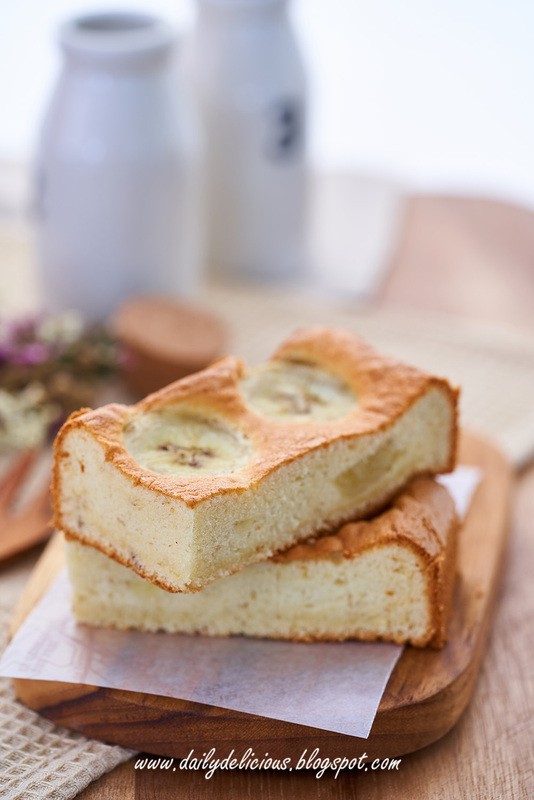 Soft and fluffy, it's what you will get from chiffon cake. I make it quite often, but most of the time I only make plain or coffee one. 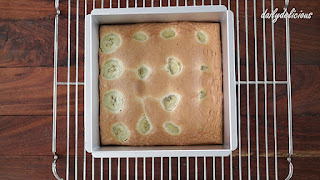 But this time, to add more flavour to this soft kind of cake, I made banana chiffon ^^. As this cake is light in texture, it's not easy to use large amount of the banana in the batter, so you can see that there is only 30 g of the banana in the cake batter list, anyway don't worry, you will add more banana on top of the cake. 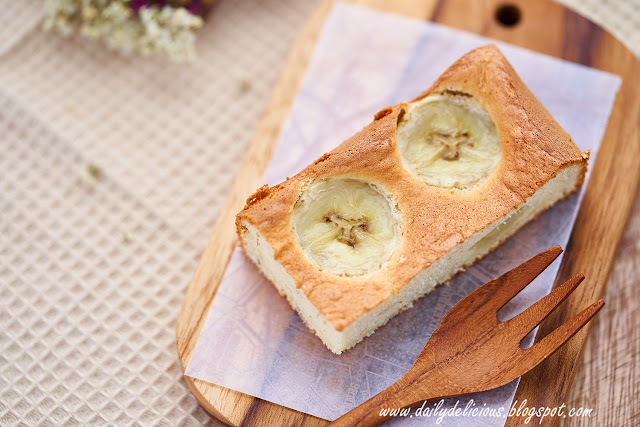 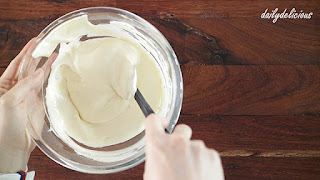 Actually, the best way to make it beautiful is using thin pieces of the banana, but if you want to use more banana, slice it thicker (it will fall into the batter), your cake will be loaded with delicious banana taste, hehe. 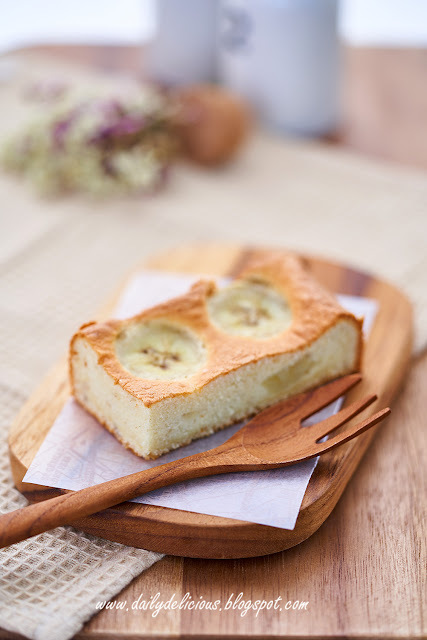 It's Songkran festival in Thailand, and because of a lot of holidays in this month, it makes me becomes lazy plus I still feel tired from participating Modern pastry class (we made 12 kinds of entremets in 4 days, from 9-5 ^^"). 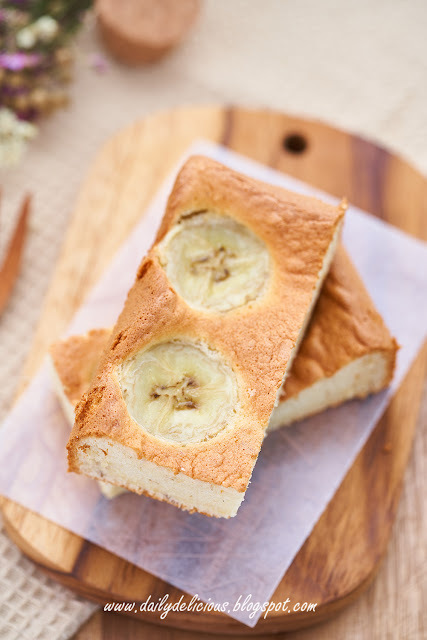 It's great class with good teacher, and I will post the full blog soon. 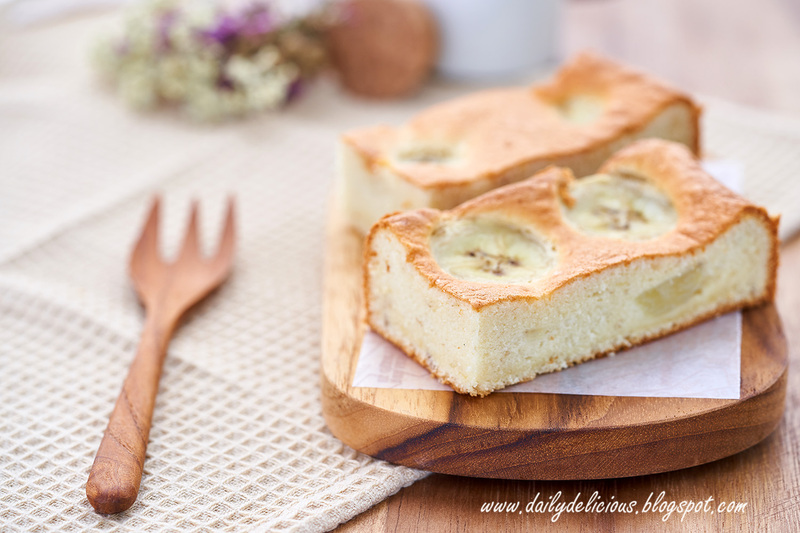 So, forgive me for not posting as much as you want, (I know that you're waiting for new recipe to try too, right), as I will post more when I feel better. 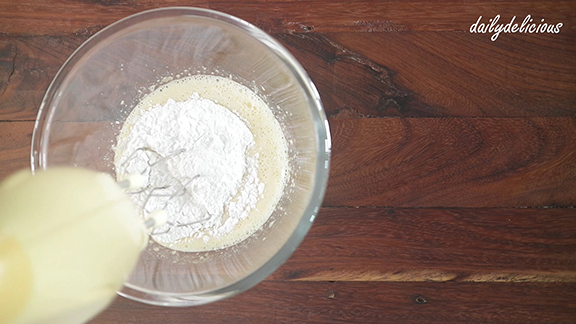 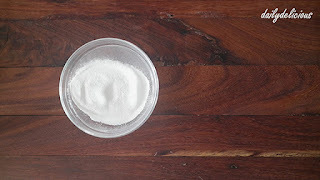 Sift the cake flour and baking powder together, set aside. 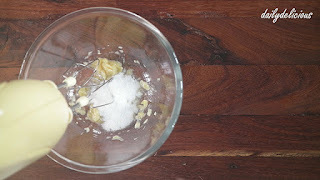 Beat the banana with sugar (A) and pinch of salt until smooth. 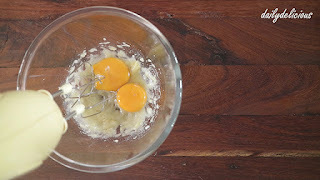 Add the egg yolks and beat to combine. 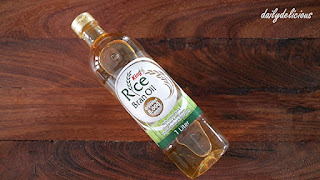 Pour the rice bran oil, vanilla extract, and water into the bowl and beat to combine. Mix in the sifted flour, and beat to combine. 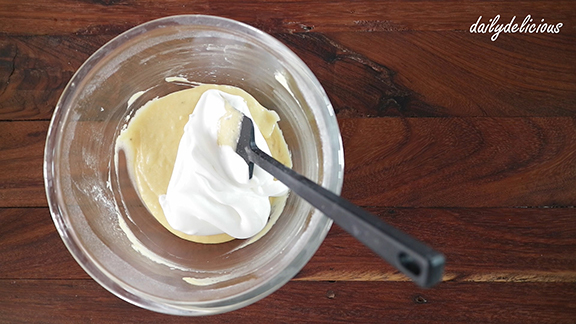 Set aside while whipping the egg white. 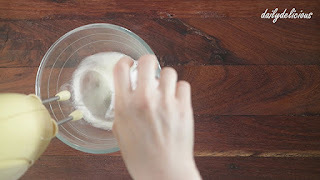 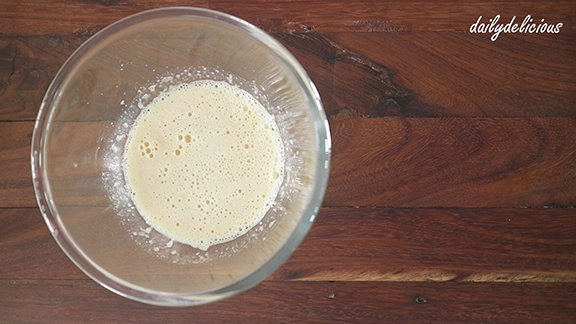 Beat the egg whites until foamy, add the sugar (B) gradually. 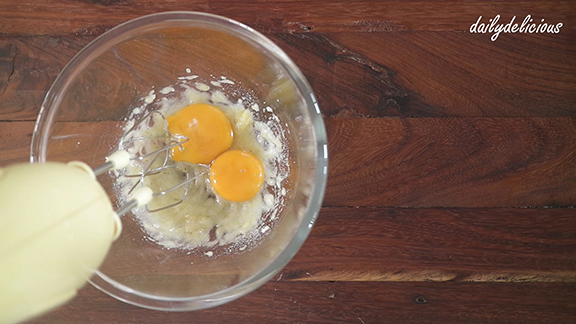 Fold 1/3 of the meringue into the egg yolks bowl. 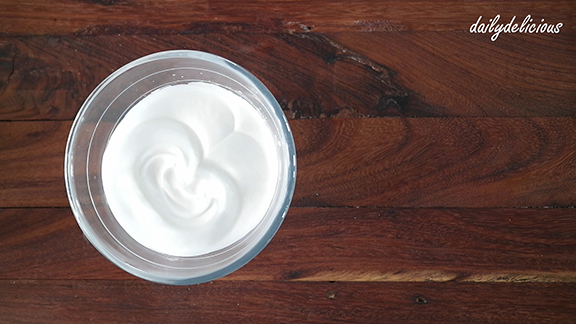 Then fold the rest of the meringue in 2 additions. 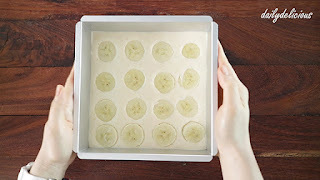 Place the banana pieces on top. 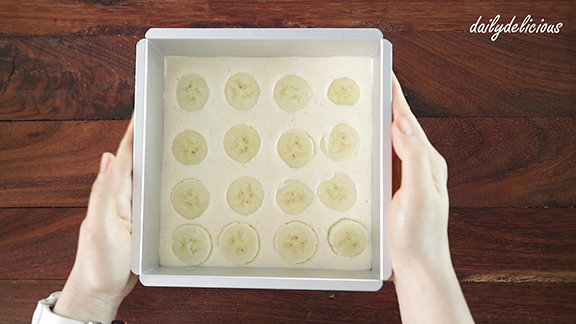 Let it cool completely in the pan before cutting into pieces. This cake looks so delicate and moist! 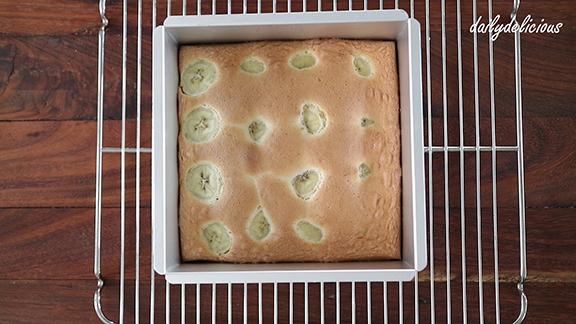 Can't wait to try this recipe!